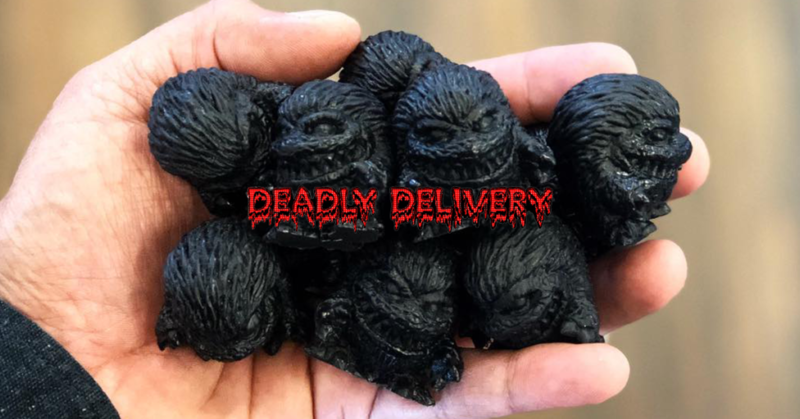 Those guys at Deadly Delivery are about to deliver once again with the return of their Saturday Deadly Delivery! Now if you don’t know anything about Deadly Delivery, they sell out within minutes! No messing around. So what we are about to disseminate, please take note. As a treat for all the loyal Critter fans out there Deadly Delivery have created a criter two-pack! A final release of Zectron’s classic Deadly Furball and an all new version from the twisted mind of Retroband himself. Packaged together with no ordering limit so you can build an army or even grab a bunch to paint yourself! Also dropping is an all new figure from VileSore inspired by the cult classic genre bending anime “Perfect Blue”. The Secret Admirer is creepy and haunting but no one will ever love you more than he does. If that isn’t enough, the final version of Retroband’s Slaughtered Curse figure inspired by the greatest werewolf movie ever made will be released tomorrow. All will be available from Noon CST (5pm GMT) from the Deadly Delivery site HERE.